To the sounds of waves on Lake Champlain, you’ll find yoga. Liz Moore started practicing there this summer. “It’s been awesome,” Moore said. Monday was her puppy Hooper’s first class. But instead of demonstrating a proper downward facing dog, he lounged around. “He was a super good yoga dog today,” Moore said. The Community Sailing Center teamed up with Evolution Physical Therapy and Yoga to offer the classes. Rachel De Simone is one of the teachers. She said they’ve offered Yoga on the Dock for a few years, but it’s become so popular that it’s now three days a week. Classes are offered Monday, Wednesday and Friday mornings from 7-8 a.m.
An increasing number of people are picking up paddleboarding as way get out on Lake Champlain. The Stand Up for the Lake paddleboard race has quadrupled participants in the past eight years with 85 paddlers from around the country participating in this year’s event. “I think industry-wide, nationwide, the thought is that paddleboarding is still growing. I think in Vermont it is certainly growing,” said Russ Scully, founder of the race. 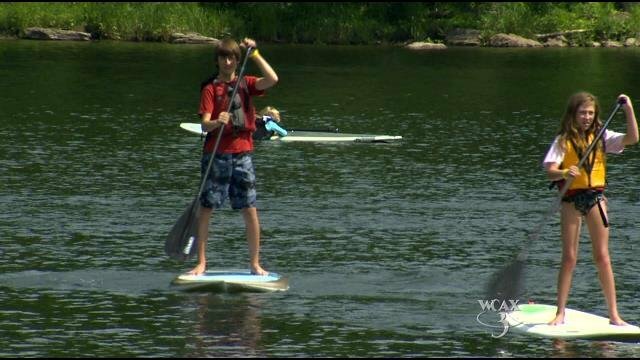 About 85 paddlers of all ages gathered at Burlington’s Oakledge Park on Saturday for the eighth annual, Stand Up for the Lake paddleboard race. The competitors participated in either the 6-mile elite course or the 3-mile recreational race. Action sports pro Chuck Patterson came all the way from Hawaii to take part in the event and shared tips on paddling form with fellow racers. BURLINGTON, Vt. –Celebrate the outdoors today with the 8th annual stand up for the lake festival. The festival includes a stand up paddle board race of some of the most elite paddle boarders around the world, including some from Vermont. The event is hosted by The Spot and Wind and Waves and the proceeds all go to the Community Sailing Center in an effort to get more people out onto the lake. “When people come in play out on the lake, they have a personal connection to it and keeping our lake clean and healthy, a source of our drinking water for a large population in Burlington, its important to us that we can celebrate it and learn how to take care of it,” says Jen Guimaraes, Associate Director of Community Sailing Center. Sailing out of Burlington is getting easier thanks to the Community Sailing Center and the newly approved Burlington Harbor Marina project. In late June, Burlington City Council approved plans for a new 160-slip marina. With that, and a new facility for the Lake Champlain Community Sailing Center in the works, there’s no excuse not to learn to sail this summer. Over the last year, nearly 6,000 people have gone through the Community Sailing Center’s programs, taking part in everything from adult learn-to-sail classes to “Floating Classroom” visits. The center also hosts high school and University of Vermont racing teams and rents sailing dinghies, canoes, kayaks and SUPs.